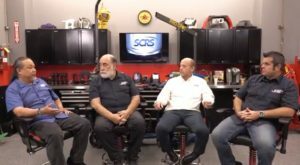 A collision repair instructor, distributor and two shop owners gave some new examples of what not do while squeeze-type resistance spot welding and added to their earlier shop electrical system advice in two new videos recently released by SCRS. Parts 2 and 3 of the Society of Collision Repair Specialists’ free educational trilogy on STRSW dropped last month and built upon September’s Part 1, which more extensively examined shop electrical infrastructure. We’ve covered the major points from all three and done one roundup from Part 1 already. “Preparation is 99 percent” of a weld, Gruskos said. And while some welders might advertise they can weld through e-coat, but the substance isn’t conductive, SCRS educator Toby Chess (Kent Automotive) said. Some OEMs want the e-coat to remain for corrosion resistance because they don’t want collision repairers to use weld-through primer. The solution for a shop is to use shunt pliers to create an electrical circuit which allows the resistance spot weld through the e-coat. The pliers are “usually a required thing,” Chess said. Many repairers will attempt to manage the process using vise grips, but they’ve got a small head, Chess said. The proper shunt pliers, on the other hand, have copper heads and a wide foot. But Gruskos said he heard that the newer metals being used on panels today require “very fast, very low heat.” Metals “hate heat,” he said. “The worst thing you could can be doing is using an antiquated welder,” Gruskos said. An older welder’s gun might also lack adequate tip pressure, and “it can’t even meet the spec of a car today.” Gruskos said. That limitation doesn’t just apply to exotic or luxury vehicles. Gruskus said the older “tong guns” were unable to deliver enough pressure, which led to the switch to the new “trans” and “C” guns. Tip pressure is crucial — it’s part of the science behind the weld, according to Chess. After the resistance liquifies the metal, the pressure pushes the molten metal together. “If you don’t have enough pressure to force (the metal) together, then your welds will be weak,” Chess said. He noted that Honda put out a requirement that banned MIG welding on the A- and B-pillars and rocker reinforcement — only pulsed spot welding was acceptable. But the older pulsed welder guns might lack enough tip pressure to meet Honda’s pressure spec, he said. Gruskos, Chess, and fellow panelists Kye Yeung (European Motor Car Works) and Barry Dorn (Dorn’s Body and Paint) talked at length about ensuring the welder had enough power in Part 1. But they expanded further on the topic in Part 3. In every neighborhood, “there’s always something” that affects a body shop’s power supply, he said. Problems can arise when a shop uses an extension cord unless the repairer compensates, Dorn said, describing a situation where using a standard 20-foot extension cord instead of plugging the welder directly into the outlet forced the shop to crank up the power to the welder to achieve the desired result. A circuit with too many demands can also affect weld quality, according to Yeung. Yeung, now the SCRS chairman, said European Motor Car Works had instances where the fuses were occasionally blown while using a welder. Ultimately, it determined that the shop’s infrared lamp was in use during those instances, and the shop exceeded its amperage. “We have to talk with our electrician,” Dorn, a former SCRS chairman, advised shop owners. He recalled going to OEM training and experiencing one welder result when it was hot out and another when it was cold — the air conditioning at the training venue was the culprit. “That’s a huge thing that I know most people don’t think of,” Dorn said. Shops must think to ask their electrician: Will the welder survive the “plateaus” of a cranked heater or blasting A/C in winter or summer? Gruskos also pointed out that European welders might be designed for the 380-volt electrical systems used on that continent, and might not work as well with the 220-volt American electrical infrastructure.